Out of the ashes of Spellcaster comes Idle Hands, a band who take all the promise of Spellcaster and form it into their own triumphant new idea. As the band crosses new frontiers in tight jeans with goth rock fringes these guys are unleashing something truly fun and powerful. These Eisenwald signees understand the beautiful and raw power of the NWOBHM but they bring in a variety of other ideas in order to craft a sound that while full of retro flourishes feels wonderfully 2018. Flashy and yet strangely restrained, Don't Waste Your Time is a powerful rock classic. I think the moment the band really came together for me was watching their video for I Feel Nothing, shout out on the salt flats. There is an incredible sense of fun with the bands look, but they tie it into something far more occult. The group doesn't seem to want to throw their entire souls into maddening rock and roll damnation. Rather they seem to enjoy reveling in a mid tempo punch. The way that they crunch forward, one sneer at a time is fascinating, but tied into that is the bands flair for the dramatic. The soaring vocals, and potent, almost AOR-esque guitar solos speak to the bands ability to truly understand a decade. Idle Hands understand the magic of the eighties but they are unafraid to infuse it with modern sensibilities and clout. They get what makes for a great song but they enhance it with bold new ideas. 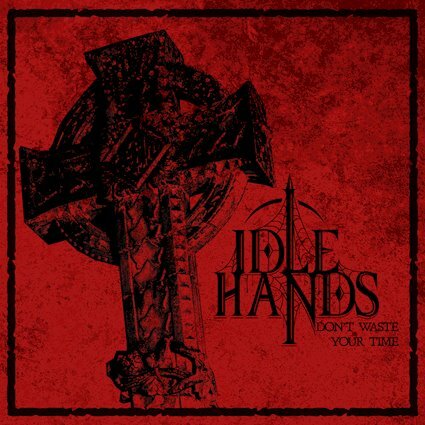 While it would be easy to dismiss Idle Hands as just another NWOBHM flavored band coming out in 2018, they bring so much more to the table. Even their most galloping moments are counterbalanced with an almost The Cure-like sense of deep and fragile emotion. This is an emotionally complex and incredibly interesting listen. Dig in.